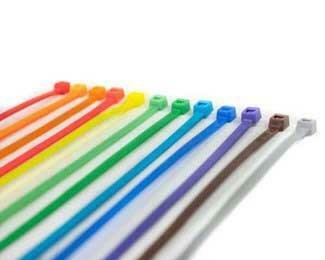 Colored cable ties are available in a wide variety of lengths and strengths. Lengths range from 4” – 21” and available strengths include 18lb, 40 lb, and 50 lbs. Standard Colors include Natural, Black, Blue, Brown, Green, Grey, Orange, Pink, Purple, Red, and Yellow. Available Fluorescent Colors are Blue, Green, Orange, Pink, and Yellow. Bulk packaging of 1000 pieces per bag and smaller packaged quantities of 100 per bag are available. Colored cable ties are the preferred option anytime distinguishing ties are needed for cable and wire bundling applications.